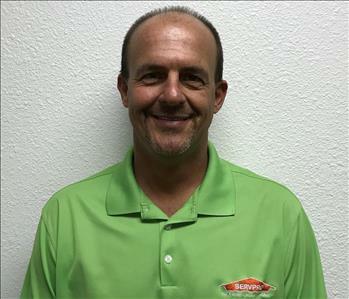 Shane Parish is one of the owners here at SERVPRO® of Hurst-Euless-Bedford. He has over ten years of experience in the restoration industry and over thirty in the customer service industry. He’s certified in WRT, CDS, ASD, Carpet Cleaning, Tile Cleaning, LLRT, Time & Materials and FSRT. He is one of our fearless leaders here at SERVPRO® and is not only driven to succeed himself but pushes all of us to succeed as well. Shane is originally from Ohio, where he met his wife (our other fearless leader and owner – Angie! 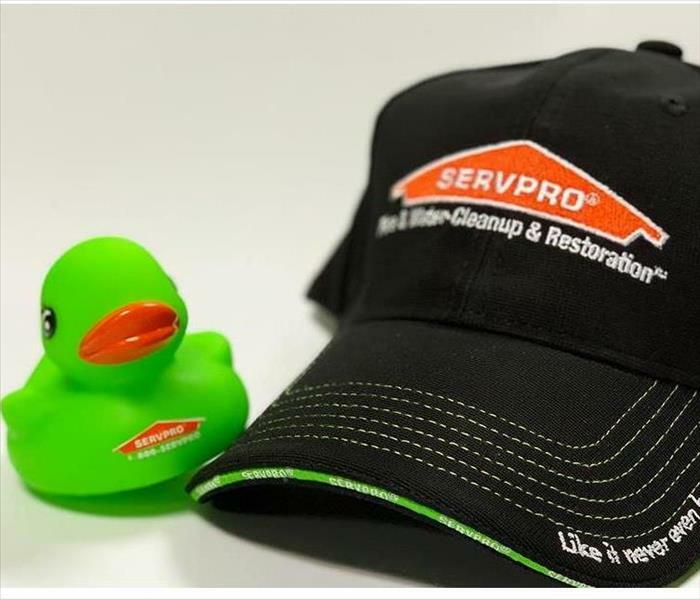 ), before moving down here to open our three SERVPRO franchises. When he’s not working you can find him swimming in his pool, playing with his two Miniature Pinschers: Meeka and Strider, or racing. His favorite movie is The Green Mile and he loves Mexican food! 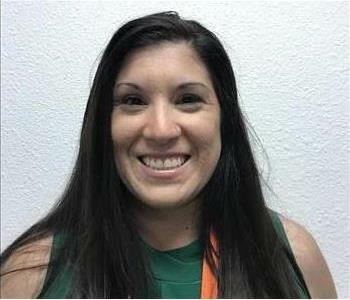 Angie is one of our owners here at SERVPRO® of Hurst-Euless-Bedford. She has over ten years of experience in the restoration industry. She’s also certified in WRT as well as Lead Renovator Certified. She makes sure everything runs smoothly here in the office. Angie is originally from Ohio before moving here to Texas with her husband, Shane. When she isn’t working you can find her watching The Voice and The Walking Dead. She loves to travel to go see her mom up in Ohio. Her favorite food is Mexican! 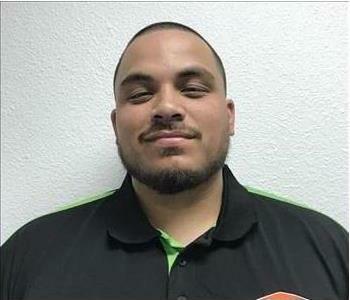 Dakota is one of our Production Managers here at SERVPRO of Hurst-Euless-Bedford. 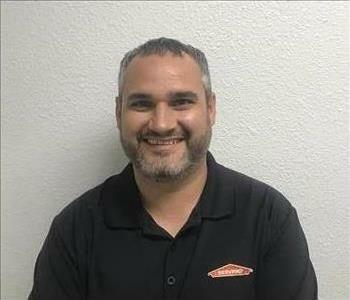 He has two years of experience in the restoration industry and three years of experience in the customer service industry. Dakota is so dedicated to our customers and he has a sense of detail that really makes him a stand out leader. Dakota was born in Keene, Texas before being raised in Windom, Texas. In his spare time, he loves to travel with his wife, play with his dog, bear, and play disc golf with his friends. He also likes to go to concerts and spend time with his family. His favorite movie is Full Metal Jacket and his favorite food is lasagna. Jessica is our Office Manager and does a great job of keeping the office organized. She has 16 years of experience in the restoration industry, and there is no question she can’t answer. Her incredible sense of humor keeps both employees and customers smiling. 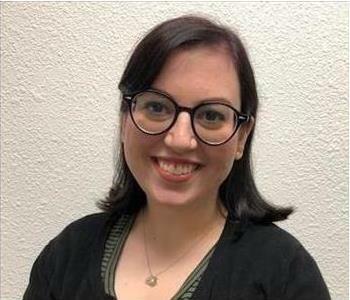 She is IICRC WRT, and T&M training certified, and her favorite things about working here are the family atmosphere and getting to help people during tough times. During her free time, Jessica loves to spend time with her adorable son. She is a proud Ravenclaw and a Mexican food aficionado. She is one of the most caring people in the office and always tries to help out wherever she can. Jessica is also working on writing her very own novel! 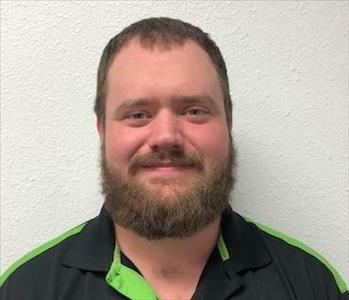 Corey is a Production Manager at SERVPRO of Hurst-Euless-Bedford and has nearly half a decade of experience in the restoration industry and also has 18 years of experience in the customer service industry. He is an extremely motivated worker which means that he always makes sure the job is done right. He is ASD and WRT certified and is always ready to jump in and help. In his spare time, Corey enjoys training his dog Lexi and watching sports on the television. He is a big fan of the Kansas City Chiefs. He also likes to draw or play video games and loves the movies Tombstone and Old School. 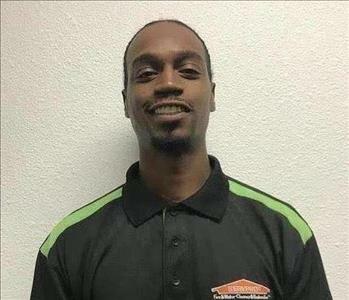 Aaron is a technician here at SERVPRO of Hurst-Euless-Bedford, and he is WRT, Fire, and Odor Removal certified. He is a hardworking guy who is never afraid of a challenge and loves getting to help people. He also has nearly a decade of experience in the restoration industry and the customer service industry. In his free time Aaron likes to watch sports, his favorite athlete is LeBron, or catch up on sleep. He loves playing with his dog, Chief, and his favorite food is cheesecake. Beth is a Business Development Manager here, and she loves having the chance to help people in their time of need. She has almost 40 years of customer service experience and 25 years of franchising experience. She is a dedicated worker and friendly to everyone she meets! In her spare time, Beth participates in roller derby and likes to play Texas Hold ‘Em. She has 5 lovely children, and her favorite hobby is spoiling her adorable grand babies. She likes to spend time with her family whenever she can. Betty is a Marketing Support Coordinator with a passion for social media. She loves graphic design and has a degree in strategic communication from the University of Central Oklahoma. Betty’s work can be seen both on our website and our social media pages. Betty is a huge fan of Harry Potter and is particularly fond of Nifflers. She loves to play video games; her favorite games are Skyrim and Red Dead Redemption 2. She is a supporter of both the Boston Red Sox and the Oklahoma City Thunder, and also supports the Oklahoma Sooners. She also has 2 adorable dogs who she loves to snuggle with. Dominic is a technician who is always ready for anything. He has over 5 years of customer service experience, and never shies away from any task. His infectious smile makes even the longest day easier, and he loves to help people and make them smile. Dominic is originally from California and is a fan of the Oakland Raiders. He played soccer for 15 years, and his favorite candy is Sour Patch Kids. When he is not at work, he likes to play video games, cook, and hang out with his wife and 4 incredible children. Kylan is a Business Development Manager, and he always strives to make new connection and help others. 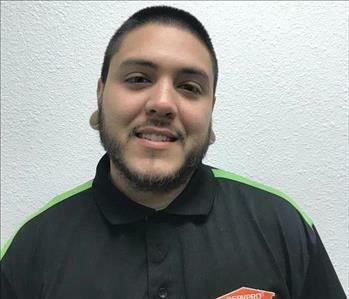 He is IICRC, WRT, and ASD certified, and is one of the most energetic people at SERVPRO of Hurst-Euless-Bedford. He has nearly 20 years of customer experience and can often be found helping out at chamber events or hosting networking meetings. Kylan is a graduate from the University of Oregon and has a wonderful wife and 2 children. He coaches Pee Wee Football in his spare time and loves spending time with his kids. Kylan also rebuilds Volkswagens and even attends and hosts car shows! Lindsey is a Business Development Manager who loves to help people whenever she can. 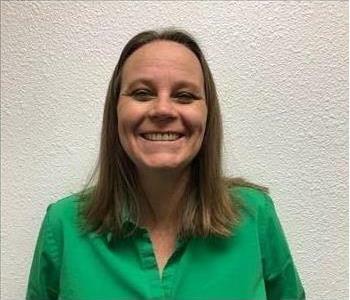 She has 2 decades of experience working in customer service, and she uses that knowledge to help people through difficult times and lift the stress from them. Lindsey stay quite busy hosting networking groups and attending other events around the community. Lindsey is a proud mom to 2 handsome boys and 2 adorable dogs. Whenever she has spare time, Lindsey likes to browse thrift stores and do crafts. She is also interested in furniture restoration. She loves to jam out to music from the 80’s and 90’s, and her favorite movie is The Wizard of Oz. Mike is a technician here, and he never shies away from extra work. Whenever we have a large loss, or we go out on a storm call, Mike is always the first to volunteer. He is HVAC and WRT IICRC Certified. His sense of humor makes every job fun, and he always has the entire team laughing with his jokes. Mike likes to play PS4 in his spare time, and also enjoys rock music. He is a huge fan of the Indianapolis Colts and loves to stir up a little bit of sports rivalry in the office. He also has 2 cute dogs, Aces and Scooby, who he loves to play with in his spare time. 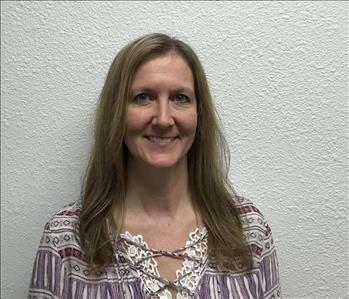 Misty is one of our Job File Coordinators, and she is great at keeping track of everything that goes on in the office. She always has the best advice and is great at motivating both herself and other employees. 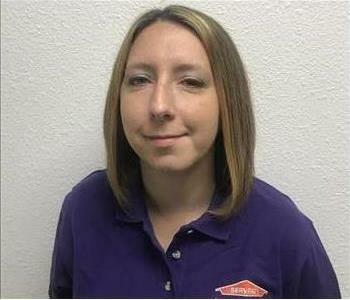 Her favorite thing about working at SERVPRO of Hurst-Euless-Bedford is the people. Misty likes to relax by hanging out with her family and her 3 dogs. She is a fan of the Texas Rangers and her favorite genre of movie is horror. She loves to watch anything scary. 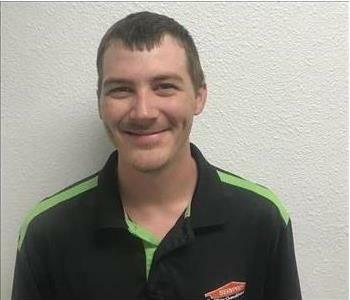 Zach Hastie is a technician here at SERVPRO and a master at mold remediation. His humor is infectious and keeps everyone smiling even through the toughest jobs. He has plenty of experience in the restoration industry and is always ready to step in whenever we get the call. Zach’s courteous attitude and lively demeanor make him a favorite around the office. In his spare time, Zach loves to watch sports; he is a fan of the Jacksonville Jaguars and the Boston Red Sox. His favorite holiday is St. Patrick’s Day, and he is always up for a round of Super Smash Bros. He is also preparing for the arrival of his new baby! Congratulations Zach!